We encourage you to donate monthly via NACH (National Automated Clearing House) service, a platform setup by NPCI (National Payments Corporation of India). Download NACH form (Front side) in PDF, print, fill and submit it to an AAP office. 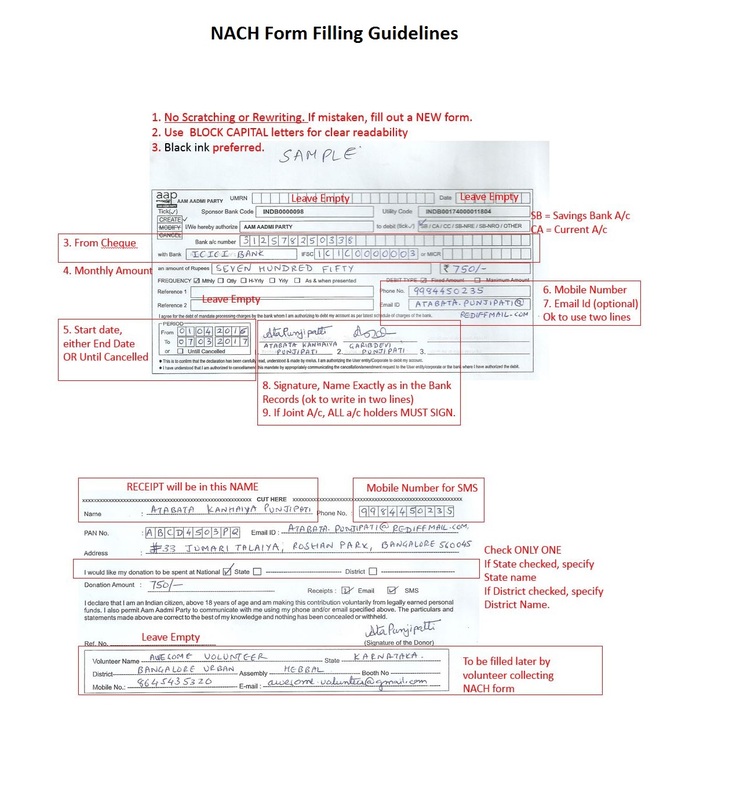 To avoid errors while filling the form, please review a Visual Guide for Filling NACH form in JPG. You may also view the Instruction side of NACH form in PDF. Income of and/or contribution to a political party registered under Section 29-A of Representation of People Act 1951 are exempt under Section 13-A and 80GGB/ 80GGC respectively. For this purpose, no registration/certification is required under IT Act 1961. Therefore, registration certificate issued by Election Commission of India and PAN allotted by Income Tax Department are the only two documents which enable a registered political party to collect contributions. You can find our registration number and PAN number below. PAN: AACAA9381P Registration No: 56/145/2012/PPS-I.